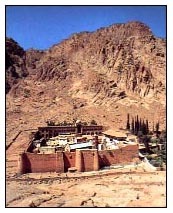 Set beneath the mountain where Moses is said to have received the Ten Commandments, Saint Catherine Monastery has been one of the worlds great centers of religious pilgrimage for over fifteen centuries. Within its imposing walls rests a citadel like no other, incredibly rich in important religious and historical structures. Among its treasures is a library of ancient manuscripts and icons second only to the Vatican's itself, and a 6th century church reputed to lie directly on the site of the Burning Bush. Quite simply, the monastery is a defining feature of the Holy Land. Copyright (c) 1997 - 2005 by interKnowledge. All rights reserved.